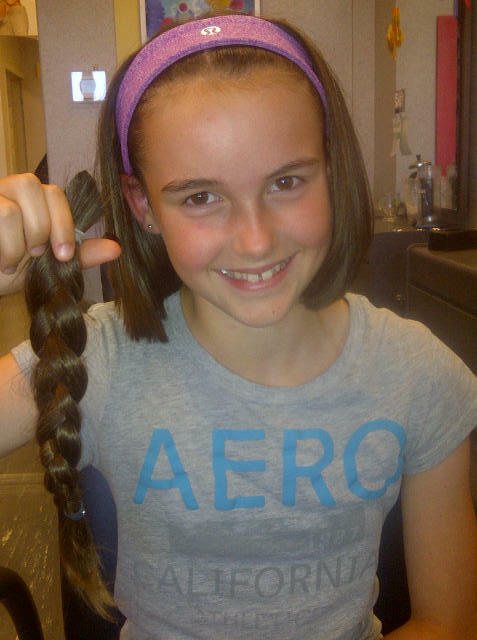 My daughter Meghan at age 12, just after she cut her hair to donate for wigs for cancer patients (for the 3rd time). When we serve others, it feels good. It just does. The motivation behind serving others varies. We may feel called to serve, be teaching a lesson to our children or it is simply the right thing to do. No matter what the reason, it feels good on the inside. While running a campaign, I thanked a woman who volunteered. She said in a quiet voice, “Can I tell you the honest truth? I do it for myself, because it feels good to help.” How awesome is that? She not only helped within the community, but she helped herself in the process. My darkest moments were during the Haiti earthquake. I felt ridiculous when I couldn’t get out of a warm bed, in a beautiful little home, to get food out of the refrigerator and a drink of water from the tap. In my mind my suffering wasn’t valid in comparison to the suffering of the people of Haiti. Looking back I had to be patient with myself – I needed time to heal. As I grew stronger, I eventually began to serve others again. And serving others helped heal myself. It doesn’t matter how you serve, as we all have different gifts and talents. Just get out there and do it! You’ll be helping others, making a positive impact in your community and you’ll get the added bonus of feeling good yourself. How do you serve others? Doesn’t it make you feel good?